2014 Totally Certified Devin Street RC Rookie #117. Condition is Brand New. Shipped with USPS First Class Package. Devin Street 2014 Crown Royale SIGNATURES Auto RC 139/299 RC !!! FREE Trial ! Double your traffic. 2014 Crown Royale Football. Card # S-DS..Serial # 195 of 299. Rookie Autograph Card. Set: 2014 Crown Royale Rookie Signatures. Team: Dallas Cowboys. Year: 2014. Attributes: Autograph, Serial Numbered. Item#: SDS. DEVIN STREET #13/25 AUTO RC Graded BGS 9.5 GEM MINT Autograph RARE ROOKIE CARD! Condition: This card is in professionally graded encased Beckett Gradings Services BGS 9.5 Gem Mint condition, 10 Autograph condition. This card is serial numbered 9/25. This card is number RGC-DZ in the set. 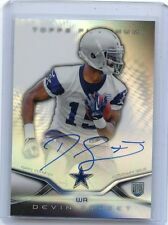 Devin Street 2014 Panini Crown Royale Auto 2/75 , #S-DS , Cowboys. Condition is Like New. Shipped with USPS First Class Package. 2014 Topps Chrome Mini DEVIN STREET #127 CAMO REFRACTOR 23/99. Check out my store for many more cards. Will combine shipping with one combined payment. Thanks for looking. DAL/NE/IND/NYJ/HOU Wide Receiver. - Any discolorations, blemishes, imperfections are directly from the scanner. 2014 PANINI SELECT. RC ROOKIE AUTO. See scans for condition. NRMT or better in my opinion. DEVIN STREET 2014 Bowman Sterling RC Rookie Auto #BSA-DS COLTS Pittsburgh. Condition is Like New. Shipped with USPS First Class Package.